Alex was born on Risa to two ex-Starfleet personnel who had retired. Being raised on Risa, Alex was no stranger to pleasurable activity. Alex, however, often took a more contemplative position instead of an active role. Alex was home schooled by his mother, so he didn&#39;t learn social skills until much later in his life. Being home schooled, however, Alex was leagues ahead of children his own age. Whenever he would leave the home, the kids would pick on him. Alex learned to hide in shadows and keep from being noticed early in life. As Alex grew into a teenager, he expressed an interest in the Starfleet Marine Corps. His parents were horrified. They knew that their son would leave them some day, but they didn&#39;t think that he would join the Core. After a long discussion, the three of them finally agreed that Alex would join the Marines. He left Risa for the Academy in high spirits, glad to be getting out and seeing the universe. Alex entered service as a medic in the marines. He worked his way up the ranks aboard the USS Devestator under the command of Captain Tom Bertlos. There he received a field commission to 2nd Lieutenant from the Marine Executive Officer, 1st Lieutenant Drakur Redragon. He was granted a platoon of his own to command, but Alex never took to the job. Instead, he transferred back to the Academy to be a teacher. think as well as fight. After a year as a teacher, he noticed a spot opened up for a marine vessel as a medical officer. He applied for transfer immediately. Though the Academy was disheartened to see one of their best teachers leave, they granted it. He was granted a promotion to Marine Captain and sent to his new post. 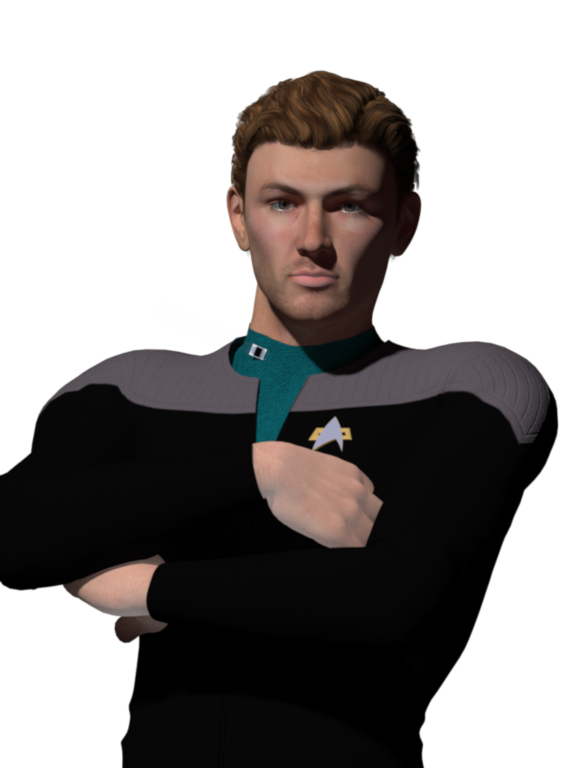 Alex joined the crew of the USS Michaelangelo along the Gorn border. He participated in numerous combat situations, but the horror took its toll on the young man. He became increasingly withdrawn, and he declined the offers to join in battle. He stayed in Sickbay most of his time, treating all of the injured that were brought to him. He never went on away missions or joined the battle. The commanding officer eventually confronted him, but Alex would have none of it. A massive argument ensued, and Alex demanded to leave the vessel. He was demoted to 1st Lieutenant and transferred to a Starbase to await a vessel to open for him.